Lucy Punch is a Londoner, she's stunning and I love the sound of her voice. Can currently be seen in bad teacher as Amy squirrel. mod edit This tread can henceforth be used to express desires for new Bond girls. We cannot continue opening a new thread each time a suggestion for a Bond girl is made. Thank you. I have to admit that ever since The Uninvited and Sucker Punch, I have the hots for Emily Browning. Browning looks like a child. She lacks the presence of an adult female, especially for that of a Bond girl. Give her 5 or 6 more years and she'll be 27 - 28. Dimi, let me ask you this. Gun to the head, who'd you choose, Browning or Daniel Harris? ;-) I'd like to see Danielle Panabaker in a Bond film (i've been smitten with her since F13), bonus points if she survied the film (that'd make a nice change from her recent roles), but that ain't gonna happen. Yes on Jaime Murray - very lovely, can wear clothes extremely well, and has loads of charisma. Check out her wildly different characters on Hustle and Dexter - she would fit in as either a good or bad Bond girl. Then put her in a minor role or wait even longer, until a new actor is cast as Bond. Simple really. And hey, as we know 20 years gaps aren't that unusual in a Bond film. j7wild, I agree. One of the joys of seeing the early Bond films for me was discovering these lovely, exotic, unkown-to-me actresses. I remember all the guys feeling the same way after our group saw GE - an experience that wasn't repeated seeing familiar and non-exotic (American) actresses in other Brosnan films. Maybe it's from being raised on the early Bond films but I always prefer women from all over the world as Bond girls. As I'm from English-speaking North America an American or even British actress doesn't seem "exotic" to me. But if Bond films take place all over the world then it makes sense that the Bond girls (and Bond allies) should reflect that cosmopolitan nature. j7wild - funny, but also a very good call. She's lovely, got incredible screen presence, is a very good actress, and is unknown to mainstream audiences. Unfortunately she'll probably be too well known in a couple of years, but she's exactly the type of actress that I would think of the series needing. To clarify my previous post - unknown and exotic is great, but I'd also like to see a great actress with loads of screen presence as well. If someone is like Rapace and is unknown to "Hollywood" then it's likely that EON can scoop them up for a reasonable price. Why pay a huge salary for Halle Barrey or Teri Hatcher when you could get someone like Famke Janssen or Noomi Rapace for less? "Hey they are famous, we don't have to put much into writing their character - proof: Teri, Denise, Halle's characters in their respective Bond films were poor and lifeless and shallow and cardboard!!" The Bond films have never needed a big name on the marquee (aside from the actor who plays Bond) to bring in the audience!! Hahaha.. Remember Plenty O Toole? I think Christina has more than Plenty! The original poster mentioned Lucy Punch. She's not Bond Girl material, but she's serious Moneypenny material - good looking but not drop-dead gorgeous, not that far from Craig's age and a consummate comedy actress who's worked in both the UK and the States in the last few years. Please no. Most annoying voice ever. I approve purely based on her looks. Never seen her act though. 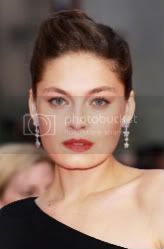 Just the other day I was telling my friend, if they ever decided to start doing new adaptations of the Ian Fleming novels, I think this Russian actress would be great as Tatiana Romanava. Also, compare her to the original illustration of the character on the cover of the novel. Antonia Campbell-Hughes. English. 29-30 years old in 2012. Bondgirl with properties close to Wailin, Camile and Vesper wth a dark inside and not intrest in men. Melis Birkan.http://www.imdb.com/name/nm2115236/ At some pictures she look like on Carice van Houten. I don't whant Carice in a Bond movie, this sugestion be a kind of middle option for people who whant see a Carice look Bond girl. Alma Saraci http://www.imdb.com/name/nm2526497/ There is always the misunderstanding there can't be more then 2 woman in it, who don't have some with Bond. Albania born and moved later to the Vs. She is fluent in Albanian, French, Italian, Spanish. For her role of Susannah in "Float", she learned to speak Armenian for a few of her scenes. Spent two months in India filming "Karma". Learned to speak Lebanese Arabic for her role as Farrah Solomon in the indie film 'Benjamin'. Amy Hunter. Black actres. http://www.imdb.com/name/nm0005034/ She have some A View To A Kill Bond girl over her. You can See her in The Kingdom and The Scorpion King. Felicity Jones. http://www.imdb.com/name/nm0428065/ Somebody who i already in mind before she playing in Flashbacks of a fool, a movie with Daniel Craig. Hafsia Herzi. Hafsia Herzi http://www.imdb.com/name/nm2082567/ Con: She turn 25 years in January 2012. Eloise Mumford http://www.imdb.com/name/nm3037833/ American. Turn 25 this year. Rachel Skarsten http://www.imdb.com/name/nm0803896/ Born in Canada, moved to the Vs.
Natacha Régnier. http://www.imdb.com/name/nm0753696/ Born in Germany, but lived in Belgium. Felicity Jones would be quite ideal for me as well.